﻿WHO: Magpul, widely considered the top aftermarket manufacturer of AR-15 accessories and components, as well as the manufacturer of the PMAG, the top selling AR-15 magazine. WHAT: Magpul XTM Handstop Kit, a kit which includes 4 pieces, the large main 2-piece handstop which is secured to the 1913 picatinny rail with a small hex screw, an additional snap-on 2-piece "bump" which may function as another handstop or grip, and 2 small standard snap-on XTM panels. The kit comes in several standard Magpul colors: Black, FDE, OD Green, Foliage Green, and PINK (!!!) All parts are polymer, standard for most Magpul parts. The kit retails for around $20 from most suppliers. 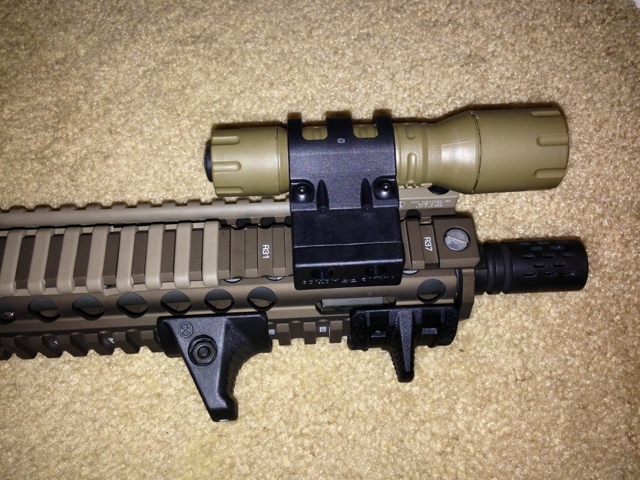 WHEN: I received the XTM handstop kit this week and installed onto a railed AR-15. I have yet to shoot the rifle with this handstop on. WHERE: This handstop would most likely be employed on an SBR or home defense AR-15. The Skinny: I was pleasantly suprised when I got the XTM kit installed for the first time. Given the fact I am so fond of the Gear Sector, a polymer kit seemed sub-optimal in my eyes. This is a light, easy to install and rearrange kit which is also customizable given that you get 4 pieces in the kit. 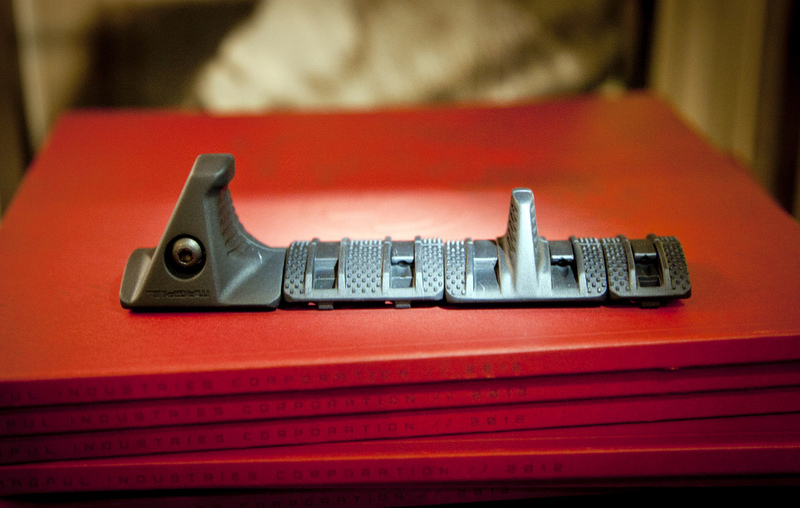 The XTM panels allow some customization and comfort. I chose to configure my pieces as in the picture above, with the handstop at the rear resting against the palm of my hand, and the smaller bump on the very front of the rail, which allows me to curl my index finger around it. This gives me positive purchase and a repeatable grip on the rail each time. In all honesty I think it is the extra "bump" piece that puts this kit over the top for me, because the ability to grab the rail in a hurry and get the same repeatable grip each time is huge for me, and the second pieces give the shooter something to index off of, versus a single handstop which just serves one function and if you grab the rail and miss your grip, you spend time fishing around for the handstop. Not only that, it is less than half the price of its competitors like the Gear Sector and IWC. The only downside I can think of it is the polymer construction is not as bomb-proof as the aluminum Gear Sector and doesn't feel as nice. FINAL WORD: 8 out of 10 (preferred), with points off for possible durability issues and picatinny mount-only.